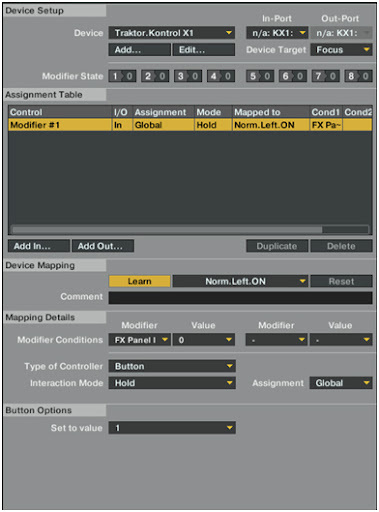 Traktor mapping tips, tricks and questions. Thread: Traktor mapping tips, tricks and questions. In another thread I added two small tutorials for mapping in traktor. It seemed like a good way to show beginning mappers where to begin, answer mapping questions, and see what other people are mapping. This way every one can get new ideas and learn how to map their own. screen shots of the mapping window. see my two tutorials down here. Last edited by Jester; 02-09-2011 at 03:47 AM. How to map master select LED output. Is also in the standard X1 mapping, but good to know, if you ever change it. How to assign a button to the master tempo button for the corresponding deck, and make it light up if that deck is currently selected as master tempo. Last edited by joostiisme; 01-26-2011 at 10:00 AM. This mapping is standard in the X1 mapping, but it is explained how it works. X1 Browser Toggle Made Easy. If you use an X1 and would like browser view when you go to select a track, and switch back to deck view when you load a track, here's what you need to do. You will need to add two extra commands, mapped to the browser knob and load button. Click on learn and move the left browse to map it. Now by selecting direct and setting the value to 1, as soon as you touch the knob the value changes and will stay there until we use the second command to change it back to "0". Now when you scroll through tracks the view will change to Browser Mode. Click on learn and click the browse knob in to map it. So now when you load a track, the view will change back to Deck View. Duplicate these for the right knob and you are ready to rock. Remember also, with the standard X1 mapping, SHIFT+LOAD toggles your view as well. Now that you've got the deck/ browser view sorted, how about monitor cue toggles as well? Lets have a look at that. Now of course you can have all 4 decks cued at the same time, what i like however is the deck that i just loaded a track into to be monitored, and thats it so here's how you do that. We'll use Deck A as an example. This first part is straightforward, Just add a monitor cue mapping set to Deck A, mapped to your load button but use "Direct" instead of "Toggle" which you will see why shortly. You need to duplicate this 3 times, mapped to this same load button, but change the assignment on these to Decks B, C & D respectively and change the value to "0". Now go ahead and test this out. Select the monitor cues and Decks B,C & D and load a track into Deck A with the load button you just mapped. Deck A will be cued but all the other decks wont be. Its not magic, its science baby! These have the same effect as modifers but aren’t triggered by buttons. These are triggered by events, preferences and current status. o	0 = when assinged deck is currently looping control won’t work. o	1 = when assinged deck is currently looping control will work. this is useful if you want certain commands to work only if something other than a modifier is on. We are going to make a button (modifier) wich, when pressed and hold, will make one knob control two parameters. This way you can adjust two FX parameters with one knob, or control the parameters with their own knobs. Now when you press and hold your button in chained mode, the modifier 1 value will be 1. 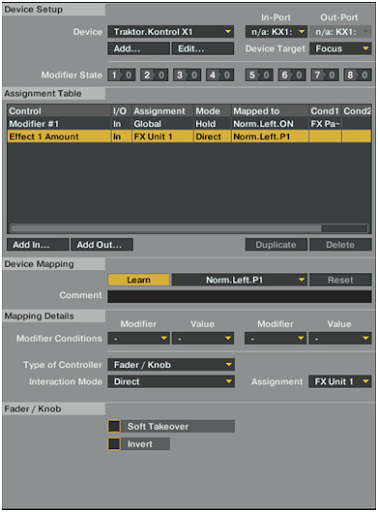 This will cause the first knob to control effect 1 amount and effect 2 amount. When the button is not pressed the knobs will control the corresponding FX parameter. This is a very easy mapping tip. You can choose to assign one effect to a button. Or a whole chain. This tip is only to LOAD the effects into the unit, not tweaking parameters or settings. o	Set the value to the effect you want the button to load. 	To load a chain repeat the same steps to the same button, each time with a different effect. o	Do this 3 times to load all three effects in the effect slots. 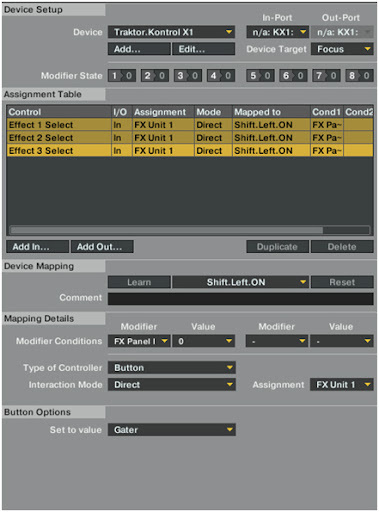 Now when you press the button the selected FX unit will change to the effects you mapped. You can repeat this process with another button to store more chain presets. This is not really a mapping tip, but non the less very useful. I did not know traktor had this feature till today. Alot of people will propably know already but for everyone who doesn’t, here you go! in the deck details tab, there is a part named deck heading. Here you can select what information is shown above the waveform. In the bottom row you see “beats” and “beats to cue”. These are the ones I discovered. “Beats” gives you the count from the first beat to the position in the song you are. “Beats to cue” counts down the beats till the next cue point. 44 is counted in 4 bars, or 16 beats. 1 is counted in beats. This feature is very usefull, to see if songs are at the same place in a build up, not only in sync. Get to know this feature and it can be of much help. This thread should be stickied i think. Great stuff mate, keep em coming. per joostiisme's request here are some of my mapping videos to add to the thread. Sorry about not quite following the posting format. Some videos will walk you through step by step, others just tell you what you need to map. So if you can't figure out what to do from the video, come back to it after learning some of the more more basic midi mappings.You also may have to go to the youtube description to get the values to map. Last edited by VanGogo; 02-06-2011 at 09:44 PM.